Saban Films has debuted the official trailer for an action comedy called Skiptrace, starring Jackie Chan and Johnny Knoxville as the comedy duo. I thought Jackie Chan was done making these kind of movies? I guess not. Chan plays Hong Kong detective Benny Chan who reluctantly joins forces with American gambler Connor Watts to take down the drug lord who murdered his partner. This definitely looks cheesy, there's no doubt about that, but hopefully some of the action is entertaining otherwise what's the point of even making these kind of movies anymore. The full cast includes Fan Bingbing, Eric Tsang, Eve Torres, Winston Chao and Michael Wong. I'm not even sure if this is worth seeking out at all, but give it a shot to start. Fists and feet are flying in this explosive action-comedy starring Jackie Chan and Johnny Knoxville. For years, by-the-book Hong Kong detective Benny Chan has tried to avenge his partner’s murder at the hands of a drug lord. When Benny learns that freewheeling American gambler Connor Watts (Knoxville) has the evidence he needs, he teams with Connor to get justice. Skiptrace is directed by Finnish filmmaker Renny Harlin, of many action classics previously including Die Hard 2, Cliffhanger, The Long Kiss Goodnight, Deep Blue Sea, as well as A Nightmare on Elm Street 4, Mindhunters, The Covenant, Cleaner, 12 Rounds, and The Legend of Hercules is his most recent film. The screenplay is written by Jay Longino and BenDavid Grabinski. 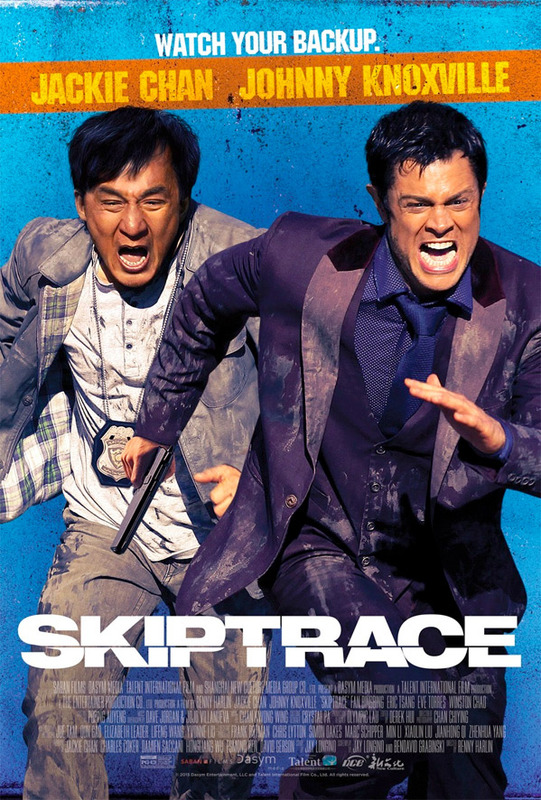 Saban will release Skiptrace in theaters + on VOD starting September 2nd this fall. Interested? I'll be happy to see Jackie on the big screen once again. That truck moment was great. The Legend of Hercules...Now that's a really horrible movie. It has a Rush Hour vibe. I like it. I'm actually looking forward to it. If anything the stunts will be amazing. They always are when Jackie is involved. This does have a Rush Hour vibe to it but I hope that Knoxville is less annoying.